We didn’t realize how reliant we had become on the internet until we largely had to do without it the past few weeks except when we got free wireless when in town. But on Friday, the Xplorenet technician came and installed the equipment we needed to begin receiving wireless internet. Our internet receiver is similar to, but not the same as, a small satellite dish. The signal at the cottage is very strong because it comes in from a tower across the bay. 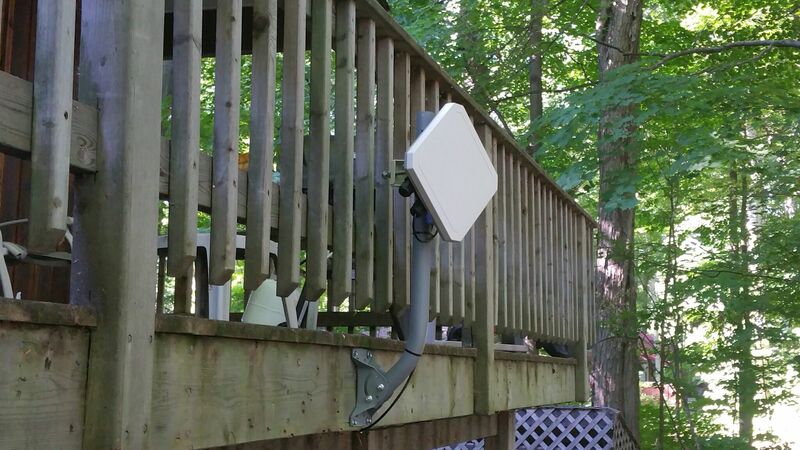 The receiver is positioned quite low, on the side of the deck just above head height, because the signal is stronger there than up high where the tree foliage interferes with it. The technician just had to make sure that some large tree trunks didn’t block the signal. Unlike other people in this ‘remote’ area, we are finding that the speed of our wireless service is at least equal to the high speed cable that we had in Abbotsford. We do, however, seem to be having some compatibility issues with Google and, sometimes, Outlook. Jonathan spent a good part of Friday evening and Saturday trying to solve those issues and made some good progress but was not able to fix it all. But our service seems to be good enough that we have no excuse not to post regularly on this site.